Roasted garlic mashed potatoes are the flavorful side dish you need on your table this holiday season. They’re gluten-free with dairy-free and vegan options. Brown butter and roasted garlic give these otherwise typical mashed potatoes some knock-out flavor. You won’t be able to stop eating them! 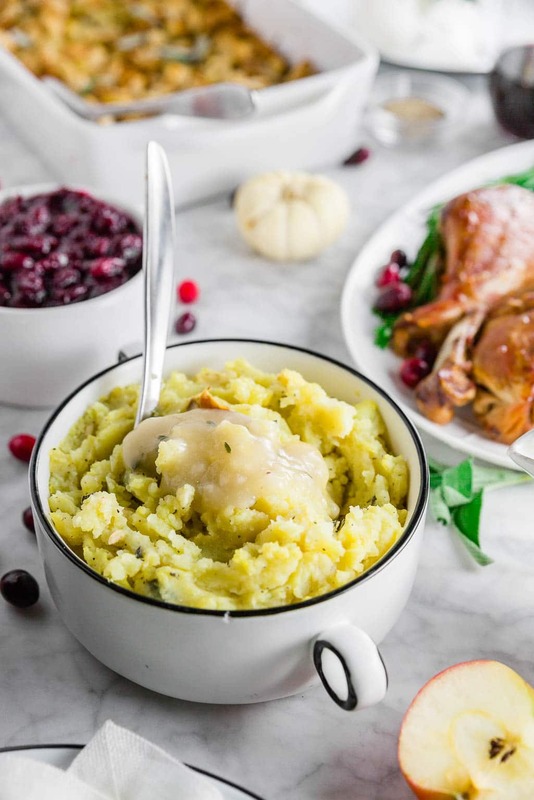 Would the holidays ever be complete without mashed potatoes? Creamy, thick, comforting mashed potatoes? I didn’t think so. If you’ve never roasted garlic before, you are in for something special. While it does take some time in the oven, it’s so easy to do and really transforms a dish. While normally you would use a clove or two of garlic, in this recipe you use two full heads of garlic. Roasting garlic in the oven gives garlic a milder, sweeter taste than if it’s cooked traditionally on the stovetop. The garlic almost caramelizes and gives a wonderful, nutty aroma and flavor to whatever you put it in. It’s pure MAGIC! Roasting garlic in the oven could not be simpler. All you have to do is cut off the top of the garlic head to expose some of the cloves. Then you drizzle with some olive oil and wrap in aluminum foil. Bake at 400F for 45 minutes to an hour, until the garlic is a deep brown and buttery, soft. You can let it cool for a bit, and then squeeze it out of it’s peel. It comes out so easily. I know what you’re thinking, is this step necessary? The holidays are busy enough, so roasting a head of garlic is just not in the cards. You guys! You can store roasted garlic for 2 weeks in the refrigerator! You can also freeze it for even longer storage. So no excuses! But really, if you really, really don’t want to roast garlic.. It’s cool. I still like you. Kind of. Just sauteé 1-2 cloves of minced garlic in a skillet with olive oil for a few minutes to get a little flavor in these mashed potatoes. Okay, second majorly big component of this roasted garlic mashed potatoes recipe is the brown butter. If you haven’t done it before, I promise it’s another super simple thing to do. Essentially, brown butter is… well brown butter. You can use brown butter in any recipe that calls for melted butter to get a deeper, nutty flavor in your recipes. You can also refrigerate it until it solidifies so you can cream it with sugar for your baked goods. I mean… brown butter chocolate chip cookies? Swoon worthy! It only takes about 5-10 minutes to brown butter and it’s such a worthwhile step to take in this recipe. Trust me on this one. You can, of course, make it ahead of time and store in the fridge for up to 2 weeks. Here, we are browning butter and adding in fresh sage leaves while it cooks to infuse our brown butter with sage for our roasted garlic mashed potatoes. Once the butter browns, we remove the sage leaves with a slotted spoon to a plate to dry. I like to sprinkle with a little salt for some added flavor. The sage leaves get slightly golden and are of course doused in butter, so how could you go wrong there? They’re great for topping the mashed potatoes for serving. Make the roasted garlic ahead of time to save room in the oven before the holidays. Store in the refrigerator for up to 2 weeks. Make ahead that brown butter. It will store for up to 2 weeks in the refrigerator. Really like to prepare ahead? You can make this whole dish ahead of time and just reheat in the oven. Stir in some warm milk to refresh the potatoes and save a little of the brown butter for topping before serving. Dairy-free or vegan? I’ve got you covered! You can make this whole recipe with dairy-free butter, such as Earth Balance, and non-dairy milk. I’ve tested with unsweetened unflavored (seriously… do not grab that vanilla flavor) almond milk with great results. Since we’re using yukon gold potatoes, you technically do not need to peel them if you don’t want to. Just wash and scrub off any dirt. Cooking for the Holidays? Try These Other Gluten-Free Recipes! Roasted garlic mashed potatoes make a fantastic side dish for any holiday meal. They’re naturally gluten-free, which makes them a go-to for all of my meals. Cranberry sauce is always a favorite at Thanksgiving, but this red wine cranberry sauce takes the flavor up a notch. You can’t have a holiday meal without a cocktail. Try my apple cider thyme mimosas for a simple cocktail that is a crowd pleaser. It’s only 4-ingredients and has all the elegant simplicity you need this holiday season. Dessert is always a must! My mini pecan pie cheesecakes are as cute as can be and easy to make ahead. They’re gluten-free and grain-free, but everyone will love them no matter if they have food allergies or not! 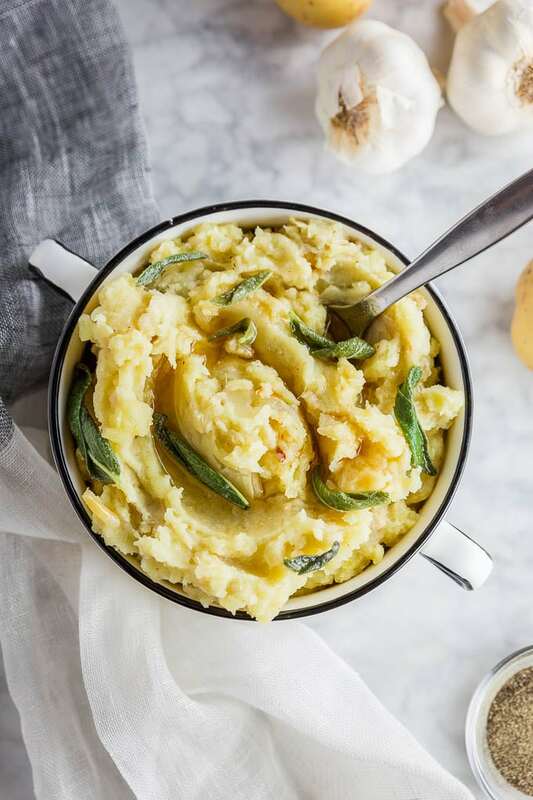 Complete your holiday meal with these roasted garlic mashed potatoes with brown butter and sage for a flavorful side dish that pairs so well with turkey, ham, pot roast and more. It’s naturally gluten-free and can easily be made dairy-free and vegan. Roasted garlic and brown butter are the stars of this simple side dish that boasts ton of flavor. Nutty, buttery, and creamy, these mashed potatoes will become a family favorite. Roasted garlic mashed potatoes are the flavorful side dish you need on your table this holiday season. They're gluten-free with dairy-free and vegan options. Brown butter and roasted garlic give these otherwise typical mashed potatoes some knock-out flavor. You won't be able to stop eating them! Cut off top of garlic, about 1/4 inch, to expose some of the cloves. Drizzle garlic heads with olive oil. Wrap in aluminum foil. Cook at 400F for 45-60 minutes, until garlic is tender and brown. Let cool. Once cool, remove from peel but gently squeezing the back of each clove until the garlic comes out. Place in a bowl and gently mash with a fork. Set aside. Add peeled and quartered potatoes to a large pot. Cover with cold water. Place pot on the stove and cook over medium-high heat until it comes to a boil. Once boiling, lower the heat to a simmer and cook for 20-25 minutes, until potatoes are fork tender. Drain water and add potatoes a large bowl. Mix together with milk, salt, pepper, brown butter (see directions below), roasted garlic. Serve with a little additional brown butter and sage leaves. Make the brown butter while the potatoes are boiling. Add butter to a small sauce pan over medium high heat and melt. Once melted add sage leaves. Bring butter to a boil and then lower heat to medium. Once butter has stopped foaming, cook an additional 5 or so minutes, until butter is golden brown and the milk fat solids have fallen to the bottom of the pot and are toasted. Be sure to not let the butter burn. Remove sage from the butter with a slotted spoon and place on a plate. Sprinkle with a pinch of salt. Use brown butter and sage in recipe as instructed above.